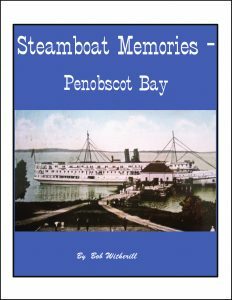 Steamboat Memories – on Penobscot Bay is about a more relaxed period of life when you could board a ship in Belfast, Camden or Rockland, and wake up in Boston ready for a day at work. It is about going on excursion boats that made hardly a sound with their engines. It is about the boats, engines, captains, and crews and the funny things that happened to them. Bob Witherill grew up summers on Penobscot Bay and watched the big steamboats go by. In World War II he was a Naval Officer. Following his retirement from teaching, he spent 28 years repairing and adjusting compasses. He was out on Penobscot Bay with his family every summer for many years. He lives with his wife in Belfast, Maine.